Discover the inspiring stories and experiences from our BEng (Hons) Mechanical Engineering graduates. "I was offered a place on the Programme and Project Management Graduate scheme at Airbus whilst in my final year of university. The scheme is made up of several placements, one of which can be at a different company. 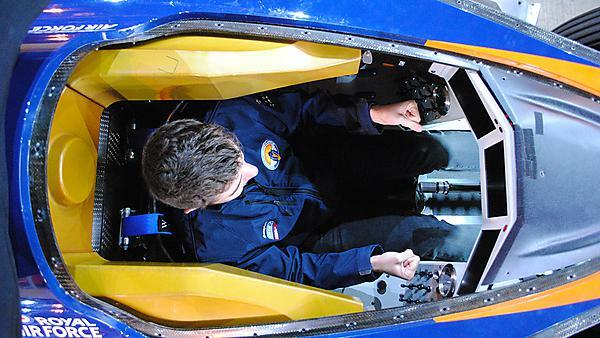 I spent four months with the Bloodhound Supersonic Car (SSC) land-speed record project team. I worked most days with land speed record holder Andy Green and engineers doing ground-breaking work at the forefront of their respective fields." "I had the amazing opportunity to be part of the start team for all 21 dynamic tests of the car at Newquay Airport." "Plymouth's extended science foundation helped me get onto the engineering pathway, particularly useful considering I only had two A levels in English and French, both grade D! Location was another large driver in choosing Plymouth, being by the sea and Dartmoor and still having lots of cultural/arts events nearby to go to is amazing. The engineering course itself, has shown me how to deal with juggling lots of work and deadlines effectively. It built my confidence, ability to think on the spot and defend my arguments through assessed debates, which is useful in a work environment. We were taught to consider environmental and ethical issues that we may meet in our careers, which is really important and eye-opening." "Completing my engineering degree at Plymouth University has prepared me well for the future. Particularly, the various presentations required has massively improved my confidence and working with many different people has improved my teamwork skills. The library service was key in helping me achieve my degree along with the help and support I received from lecturers on the course, particularly during my dissertation. Ultimately, the most helpful thing the University did was making it possible for me to go part time for my final year, allowing me to achieve the best I could and gain work experience at the same time." “Plymouth University was a turning point for me. Originally I hadn't considered going to university but I'm glad I did and now feel extremely proud of myself. I had a great time and as a result of my studies I have a fantastic job which takes me all over the world. After A levels I went straight into full-time employment as an Apprentice Welder and Fabricator. However I have always been fascinated by mechanical devices, so when I found myself unable to continue my apprenticeship due to a motorbike injury, I decided to do a technology foundation course at Plymouth University. From this I was able to progress onto the BEng (Hons) Mechanical Engineering degree. I now work as a Development Engineer for a large multi-national company and am learning from some fantastically experienced and interesting people. I am currently working with mechanical and vapour vacuum pumps and systems as used, for example, in electron microscopes and the production of television screens. My role gives me great insight into the international relevance of the course I took at Plymouth as I work in a product support role looking after products manufactured outside the UK." "I believe university should be your own choice. You definitely get out what you put in and, if you are tenacious and stick at it, there is nothing you can't do." “As part of my BEng (Hons) Mechanical Engineering course I chose to spend a year on work placement with Plymouth-based Fine Tubes, a manufacturer of precision tubes for a wide range of industries including aerospace, oil and gas, medical. As a result of my performance, the company sponsored the final year of my degree and offered me a job. However, I decided I would be better placed if I set up my own consultancy and worked with Fine Tubes independently. Ever since my placement, I have had a dream to design technology which can cut down on carcinogenic and ozone-depleting emissions from manufacturing industries, so I set up Eco Filtration Solutions (Eco FS) and have been working with experts at Fine Tubes since finishing my course last year. At the same time I entered the University’s Business Ideas Challenge and won the environmental award category. Along with some great support from the School of Engineering at the University and £1,500 in prize money, the Challenge gave me the confidence to go forward and develop my idea. The consultancy's main aim is to design and manufacture a product which will filter environmentally friendly solvents used in the manufacturing industry at 'significantly low' energy costs." "The idea is based on technology developed in the 1960's for the water industry but it has only recently possible to adopt this technology for solvents due to new research. The consultancy also acts as adviser to Fine Tubes on similar eco-wise issues. "I’ve been running my start-up, Conclient, Monday to Friday, nine to five. It’s been a bumpy ride so far, but we’ve bounced back pretty well thanks to the great effort put in by the team: Jamie, Paul, Dave, Ben, Turk, and Vachha. I’ve also been to Germany for two weeks with the Exeter University Officer Training Corps (it’s open to Plymouth students as well), which was amazing." "I left university and went straight into a job at a paper converting machine company in Southway. I saw the job on a board in the mechanical engineering block and was hired as a Design Engineer. Following a year 'on the drawing boards' I was let loose on several designs of paper napkin making machines. After four years’ service I moved into packaging machinery at Kliklok Woodman in Bristol where I designed and patented two designs for handling cake and biscuit products." “Engineering is my passion and my ambitions have always been very clear. I had an HND in mechanical engineering but knew that to further my career I would need a degree. Now I have a degree in mechanical engineering, a PhD and a job I love. None of this would have been possible without the help I received from Plymouth University. Brought up and educated in Malaysia, neither of my parents went to university but I was lucky enough to receive a scholarship to study at Plymouth. Because of the knowledge, advice and experience I gained at Plymouth, I have been able to realise my ambitions and do something I love. My job is very multi-disciplinary in nature and I have worked on a variety of projects from commissioning industrial gas turbines to furthering technology in airport runway lighting."